The rendezvous location is listed in each trip itinerary. Quite likely you’ve already decided how to travel to our rendezvous point. Please do not book your travel until your departure is confirmed by your trip planner. If you’re flying, you will want to ensure that you get a seat on the day you wish and the best price possible. Below are some details to assist you. The specific itinerary for your trip will designate the arrival date and meeting time. Your guides will be busy finalizing details until that time. Only in Fort Simpson do we meet and greet at the airport and only on the designated day. You are certainly welcome to arrive a day or more in advance and find your own way to your accommodation. The number of cabs in small communities is limited so be prepared to be patient and enjoy your new surroundings if you have to wait for a pick-up. “Day 0” on my itinerary – what is that? Different rivers present different logistical considerations. On the Nahanni we board a float plane soon after your arrival in Fort Simpson. This is “Day 1.” On other rivers it works better if we have our pre-trip meeting in the evening of “Day 0” and then depart early the following morning for the put-in. We’ve used “Day 0” for those trips where you meet in the evening. If you’re still unsure, consider it this way: On any trip, you need to arrive at the meeting point on the date listed as the first day in the “Dates and Rates” list and you may travel home on the last date listed for your trip. In our welcome aboard letter, we will specify on which date you need to arrive at the meeting location and which day you may plan to fly home. Please feel free to confirm this with us before booking your ticket. If you plan to arrive early and are wondering about activities in the area, feel free to enquire of our office by phone or Email. We can usually get you pointed in the right direction. Your guides are not available until meeting time. Most of their work is of a nature that is best handled by them alone. Similarly, following the trip your guides may have a short turn around before the next trip so they will have to leave you following the last gathering. Your indulgence in this will be appreciated by the staff. Feel free to surf the web for prices, but be aware that we get the lowest group fares for First Air into Fort Simpson, Inuvik, Kugluktuk, and Iqualuit from Edmonton. See below for the contact info for our agents who will connect you with these lowest fares. For Whitehorse, check out flyairnorth.com. If you have any questions about rates at any time, please call us first and we can ensure you are on the right track. You are welcome to make flight reservations through your own agent or if you wish you may contact our agents. They are well versed in northern travel arrangements and are happy to assist. They can also access group rates on First Air that are not available on the web. Feel free to ask us at our office if there are any recent sales that we know of. Book your flights so that you arrive on the first date listed for your trip and depart on the last date listed. You may wish to allow a layover day before or following your trip. This allows for breathing space and a more favorable transition back to “civilization”. Our itineraries do not cover hotel costs. Northern conditions pose tremendous challenges to the transportation industry. For this reason you may be required to exercise patience during the northern leg of your journey. If you are delayed for any reason, don’t worry. If necessary, call our office number at the first opportunity and leave a message regarding the nature of your situation. The good news is that our guests consistently praise the friendly service of northern carriers that other airlines have all but lost. Your northern flight will be one of your many highlights – and in a good way! Your guides will be coordinating plans at your final destination and will make arrangements to ensure that when you do arrive, your adventure continues smoothly. Alternatively, you can take Air Canada Jazz, or Canadian North to Yellowknife, Then First Air or Air Tindi to Fort Simpson. Beware that the Air Canada regional jet has low cargo capacity which can mean delayed baggage. The best option from Edmonton / Calgary or Vancouver is Air North. They provide great service and good value. Air Canada. Beware that the Air Canada regional jet has low cargo capacity which can mean delayed baggage. WestJet. They fly direct from Vancouver 3 times a week. Alternatively, you can take Air Canada Jazz, or Canadian North. NEW: Westjet now flies to Yellowknife! From Calgary or Edmonton through Whitehorse on Air North (overnight required), and then on to Inuvik on Air North. Norman Wells (Mountain) Edmonton or Calgary > Yellowknife > Norman Wells First Air and Canadian North both serve Norman Wells. 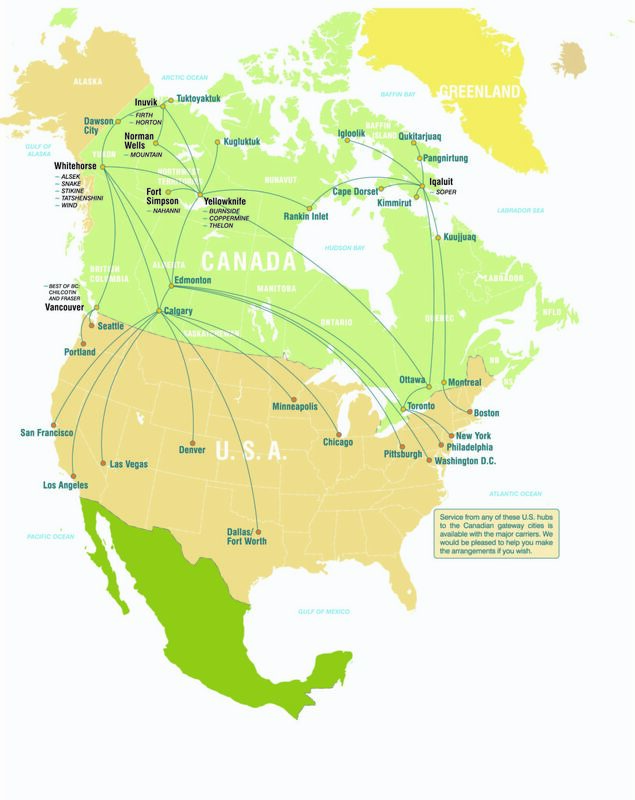 Whitehorse, Yellowknife, Inuvik, Dease Lake and Fort Simpson have federal airports with paved runways. All fuels are generally available. Fort Simpson is accessible by both the Mackenzie and Alaska highways. The most direct from Edmonton (and often the most reliable) is the Mackenzie. Both offer reasonable gravel once in the NWT and require two days to comfortably drive from Edmonton. Plan to be in Fort Simpson by noon. Upon arrival, find your way to the South Nahanni Air base where you will find your guides or a friendly person who will direct you to them. Parking is available at South Nahanni Air. You may wish to schedule your time so as to arrive a little early and allow time for tending to last minute details in Fort Simpson. We operate from the rustic float plane base belonging to South Nahnni Air, which providers efficient access to the Twin Otter aircraft. Please remember that this is a remote community and the summer season is the height of activity. At times, this base can play host to more than one group of river travellers and thus it may appear chaotic -trust that your guides have everything under control. For more driving information and conditions, please visit web: nwtparks.ca under “Highway Touring”, or NWT Tourism, at 1-800-661-0788 or 403-873-7200. Accessible via the Mackenzie Highway, Yellowknife is at the “end of the road”. The highway is paved most of the distance. The population is 15,000 and has most services associated with a larger center. Whitehorse may be reached via the Alaska Highway. The road is paved most of the way for the 24-hour drive from Edmonton. An innovative “loop” journey can be created by using one of the Alaska ferries for one leg of your trip and the road for the other route. Parking may be available at your hotel or RV camp. This is an ambitious but spectacular drive. Continuing north from Whitehorse, and just prior to reaching Dawson City, you will come upon the Dempster Highway. The pavement ends at this junction and vehicles should carry two spare tires beyond this point. The drive from Whitehorse to Inuvik is approximately 20 hours.